Where: Studio One Yoga, Number One, The High Street, Standish, WN6 0HA. 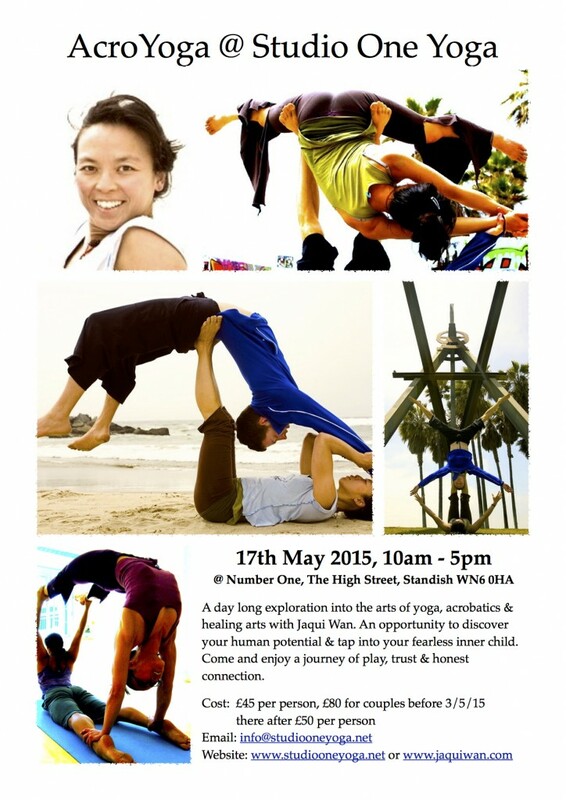 A day long exploration into the arts of yoga, acrobatics & healing arts with Jaqui Wan. An opportunity to discover your human potential & tap into your fearless inner child. Come and enjoy a journey of play, trust & honest connection. Come along and help create the opportunity to share and play within a joyous container of safety. AcroYoga combines the disciplines of yoga, acrobatics and healing arts into the one practice. This workshop acts as an introduction, no experience or partner required. Inversions & partner acrobatics – you will explore the embodiment of inversions, headstands, forearm balances and handstands. We will work progressively in small groups on static balances to sequences; involving a base, flyer and spotter with some focus on transitions. We require you have willingness to explore your fearless inner child. Healing arts – delve into the world of Thai massage and the practice of therapeutic flying, where the receiver (flyer) surrenders their weight to the giver (base) who in turn takes that trust and is able to manipulate and elongate the flyers upper body through a process of suspended and supported movements and transitions. Back by popular demand. An afternoon session to delve into the world of balancing on your hands. Have you ever been baffled by arm balances? Is it strength? Is it flexibility? Or is it fear that’s stopping you from getting your head round them? This is workshop is an opportunity to explore the mechanics of balancing on your hands. We will cover handstands, but that is only part of the offering, we will explore a range of arm balancing including Tittibasana / fire fly, Parsva Bakasana / side crow and Eka Pada Koudiyasana / split leg arm balance, but there is more we will cover. The session will begin with an asana practice and will progress lab style into the world of hand and arm balancing. Do not be fooled into thinking you will be able to do all by the end of the session, that takes practice, practice, practice. What you will get is a direction and an approach to mastering them. This workshop is ideal for the regular yoga practitioner practicing for at least 9 months to a year and who are keen to explore their hand and arm balancing potential.